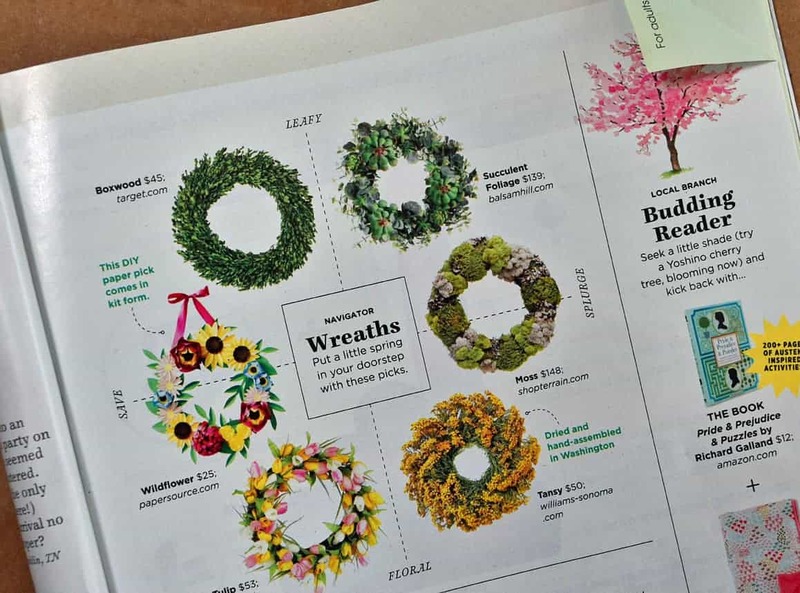 Isn’t it fun to celebrate spring with a new wreath for your home? 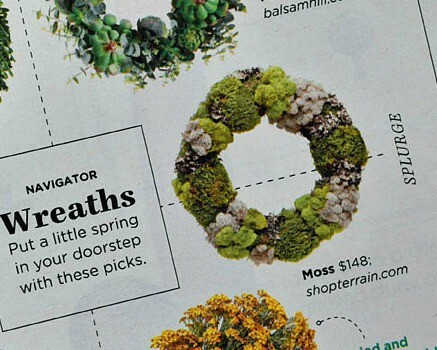 I was perusing the latest Country Living magazine, when I came across this array of spring wreaths. I’ve got a new spot to hang a seasonal wreath and was trying to figure out what would be pretty. I loved all the variety shown in this layout, but of course the “splurge” wreath, the moss covered one pictured was what I liked best! Leave it to me to pick the most expensive one; yes, I do have good taste! 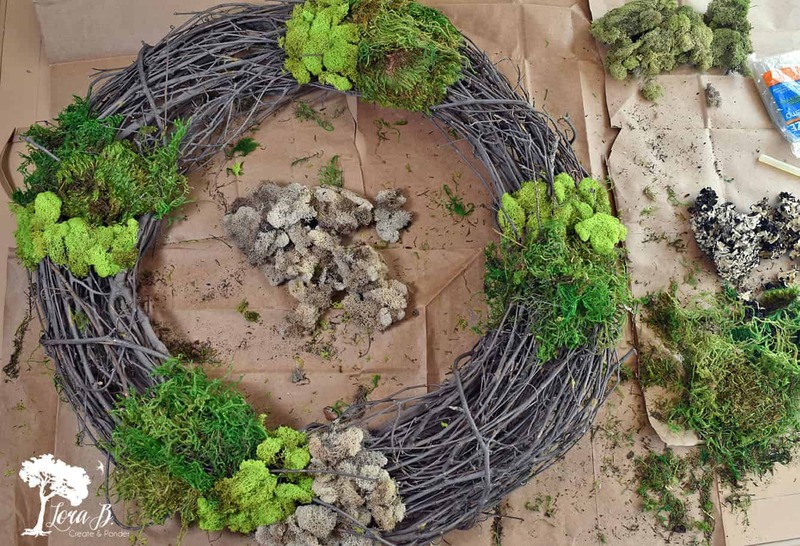 Since there’s no budget for an almost $150 moss wreath, I decided to make my own version! 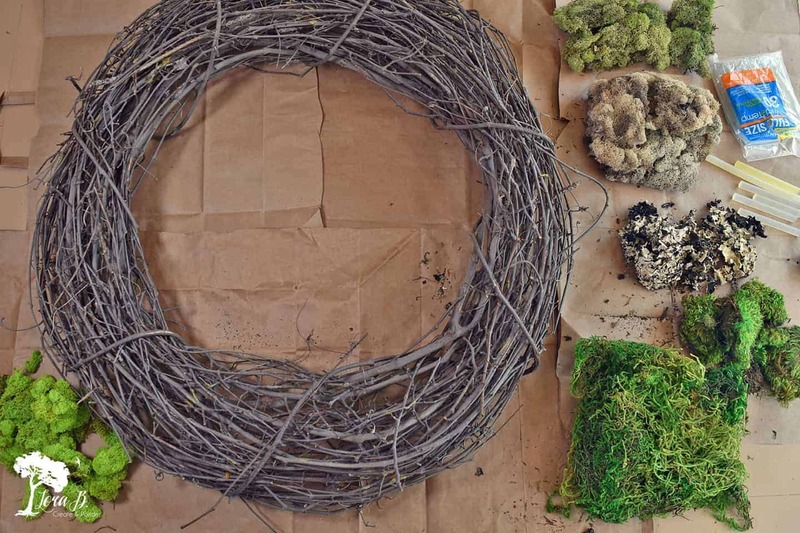 Here’s a Mixed Moss Grapevine Wreath DIY, if you’d like to create your own! If we’re going to imitate something, we need to take a closer look. Then we can decide how we’re going to vary it. Before I bought my materials, I wanted to make sure I was purchasing the right amount. 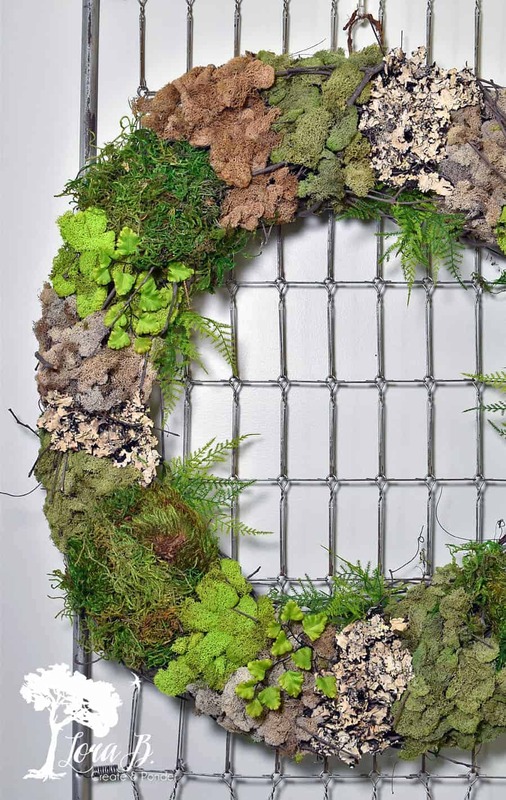 There seemed to be at least 4 kinds of moss and lichen on this wreath. Each type was represented at least 4 times on the wreath. I loved the subtle gray and green tones; just like the forest floor during springtime. 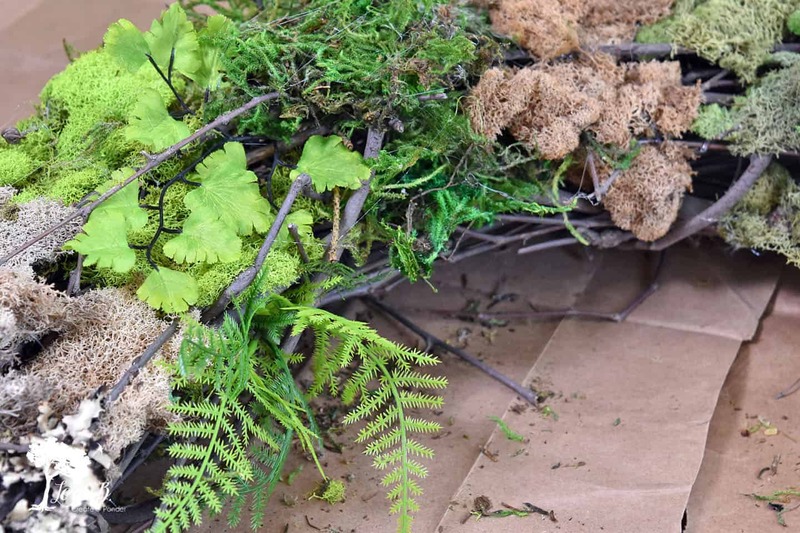 The springtime forest floor also inspired me when I created my “Easter Bunny Centerpiece How-To”. I guessed this wreath was made on a styro or straw form because of it’s exact shape, but I wanted to use a grapevine wreath form I already had. 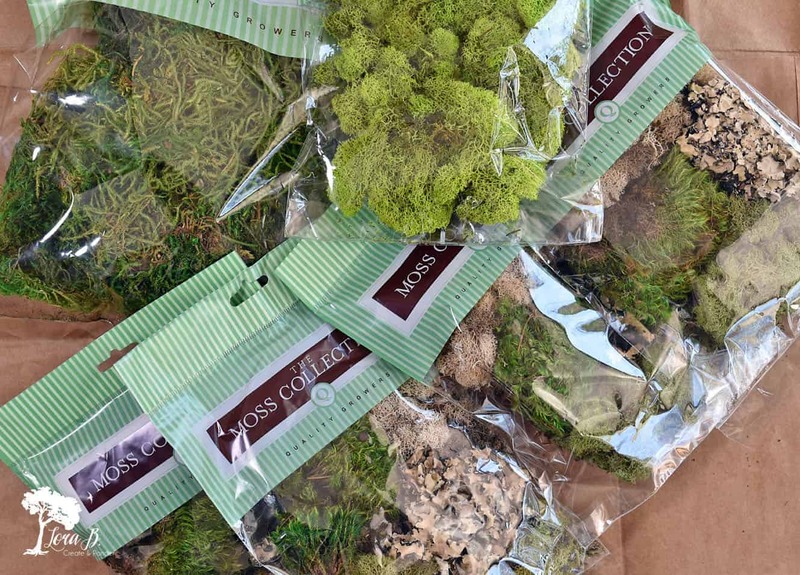 My only expense was the different varieties of moss. I bought 4 bags of a mixed type, a large bag of green and a bag of a brighter type of lichen. I knew I had a little bit at home just in case, too. I laid out all my moss by the different types and warmed up my glue gun. I started hot gluing the basic green moss at about 12, 3, 6, and 9 oclock. It looked like there were a couple inches of each type. 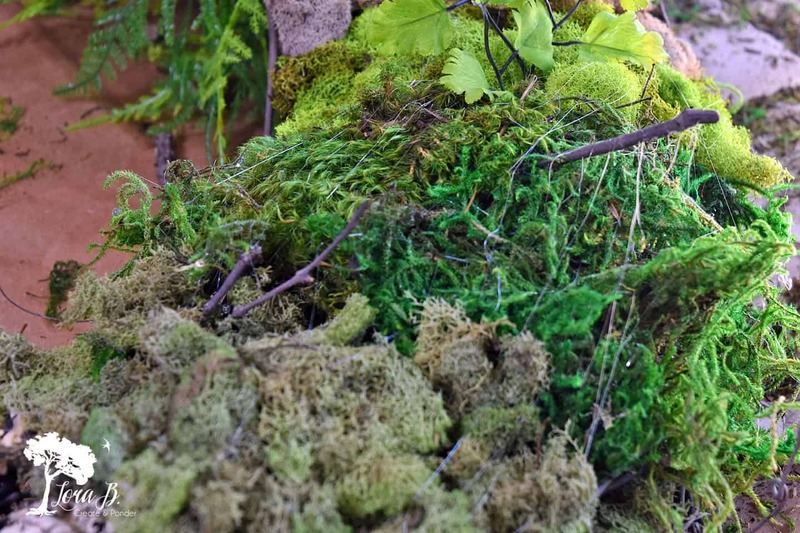 The moss was arranged by color, the greens together and the grays together. Yes, it was time consuming, but nice when I could hear springtime birds outside the window, and enjoy sunshine streaming in! What a wonderful, subtle mixture of textures! I liked how the rustic grapevine could be seen in different spots, too. 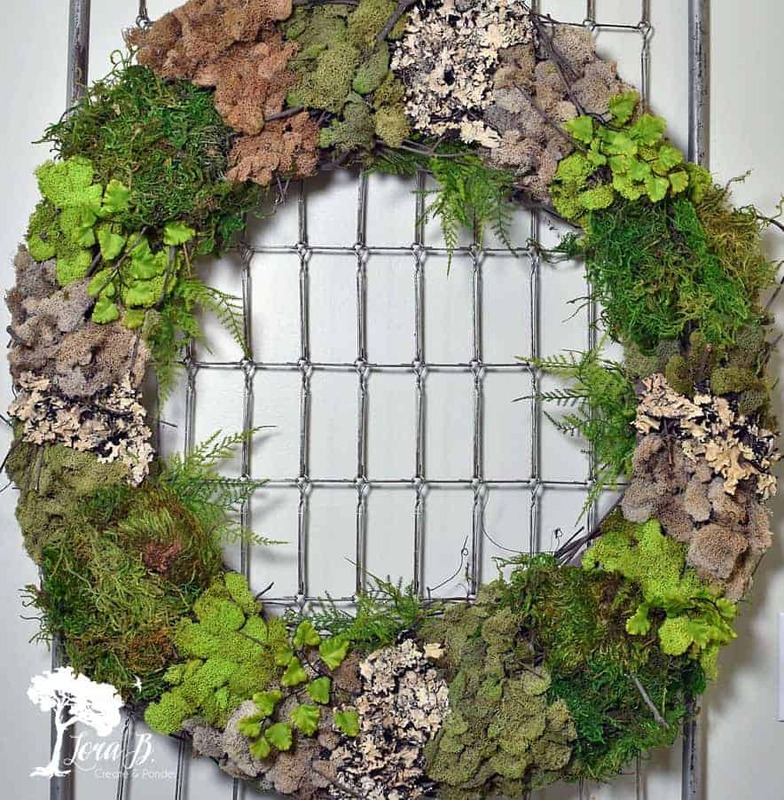 Even though my example wreath only had moss and lichen, I decided to add some feathery ferns for an additional texture. Finish Your Project With the Hair Dryer! The last step whenever you’re creating something with a hot glue gun is to melt all those pesky strings with a hair dryer. Glue strings are definitely not at home on the forest floor! The final result is a wonderfully textured array of woodland springtime! It’s a nice change from flowers, and a look I will not tire of quickly. So different to have moss and lichen as the main character and not just a supporting foundation. I can’t wait to work it into it’s springtime vignette! 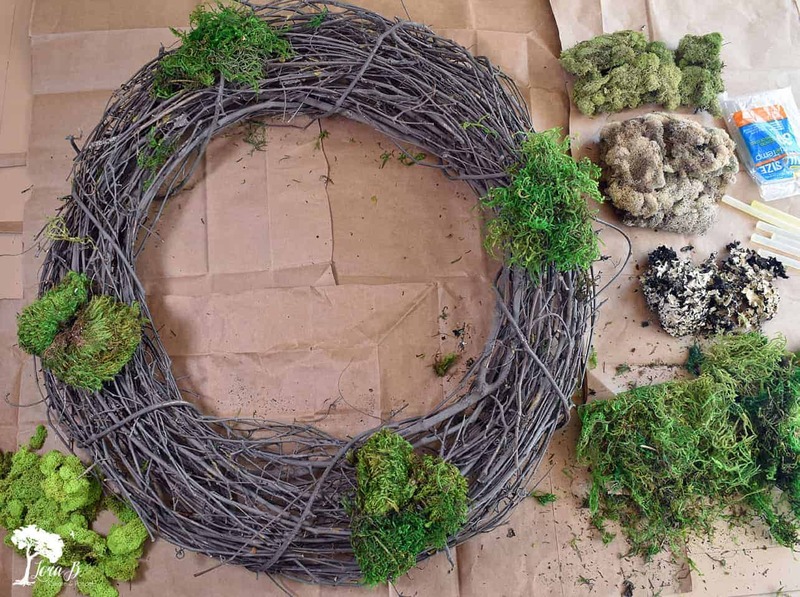 It really was easy to make, once I had all the packages of moss and lichen. And I only spent about $50, compared to the $150:) It just involved patiently hot gluing little pieces, while I kept referring back to the original picture. 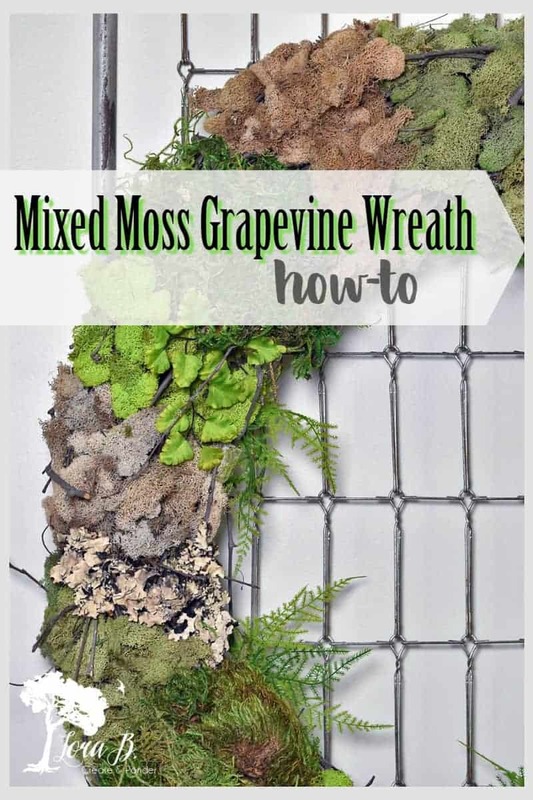 Maybe this how-to will inspire you to create your own Mixed Moss Grapevine DIY! Lora, I can’t even! (I wish I had been the host for HG this week… you would have been my first pick!!!) So stinking gorgeous, and I love the fern you added! I keep shaking my head at how pretty this came out. Pinning to several boards, girl! Thanks for pinning, Julie! I’m enjoying it thoroughly! Love the big, bolt of textural green on my wall. Don’t think I’ll tire of it easily, either! 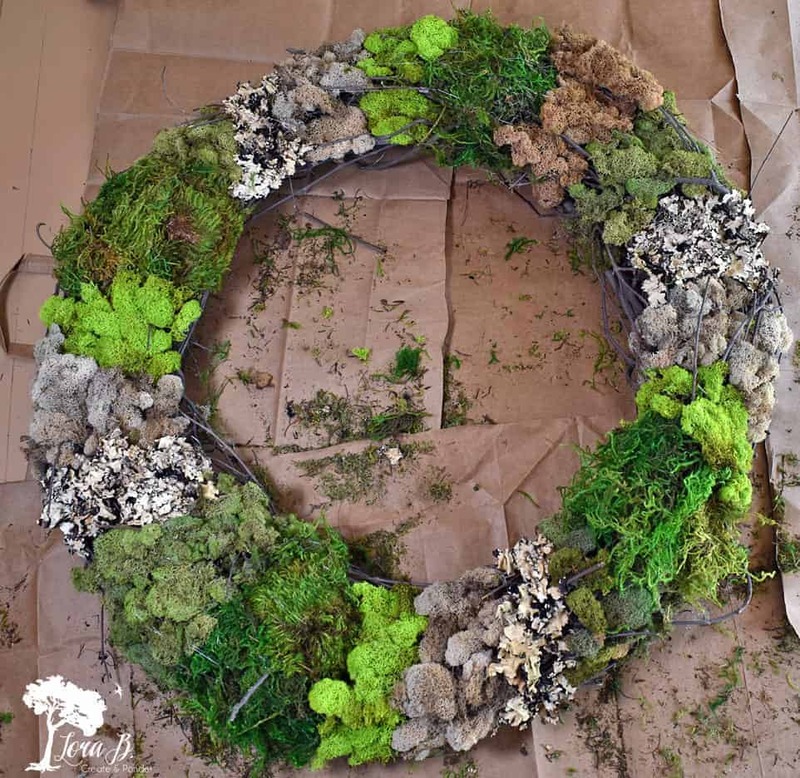 Lora, I really love the look you achieved by mixing the different mosses! Thanks for sharing at Vintage Charm–pinned! It was a fun project, Cecilia! Thanks for pinning! I love it and with the added ferns, i think yours is better than the others. Whatever you want to post i am here to read, i can’t hardly wait for fridays to see what you have. Hope you had a great week with your kids. Absolutely love this wreath. I am a forest and garden person and it really appeals to me. Thank you so much for sharing! I think I could say I’m a forest and garden person too, Frani! Probably why I loved making this one! Glad you liked it! That is so beautiful, Lora…and quite a savings, too! Thanks, Linda! I’m really enjoying the subtle, spring textures!